We spotted the signs this past week, but had heard about the plan from Susan Melrose of the West Seattle Junction Association and Erica Karlovits of the Junction Neighborhood Association, both of whom worked hard to help make the park happen in the first place; Melrose brought the problem up at the Southwest District Council meeting back in February. ORIGINAL 5:35 PM REPORT: Quite the crowd at the corner of 42nd and Alaska, and the event is about to start, ceremonial ribbon-cutting at all. Lots of Junction luminaries are here – and other parks supporters – plus City Councilmembers Sally Bagshaw and Tom Rasmussen, present and past chairs of the council’s Parks Committee, deputy Parks Superintendent Eric Friedli, and Parks Board members including chair Jackie Ramels of Alki. With the big scissors, that’s Erica Karlovits, president of the Junction Neighborhood Organization, and Susan Melrose, executive director of the West Seattle Junction Association, who co-chaired the final push for park completion. (Karlovits and Melrose walked away from the stage cheering, “It’s dedicated!” Right about this time last year, they were still collecting donations – in jars and barrels at West Seattle Summer Fest.) The young helper in the video is Mia Presser, daughter of Junction-based TouchTech Systems proprietor Brian Presser. 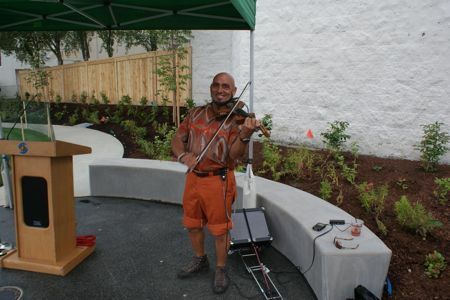 Meantime, violinist Pasquale Santos is playing “Don’t Stop Believing,” and that is a fitting anthem for the West Seattleites who worked so long and hard to make this park a reality. One week after the sun-splashed planting party in which volunteers like the group above helped place 1,000 native plants at Junction Plaza Park, the city has sent out another reminder (see it here) that the park dedication (first announced last month) is coming up in 10 days – 5:30 pm June 29th, one week from Tuesday. 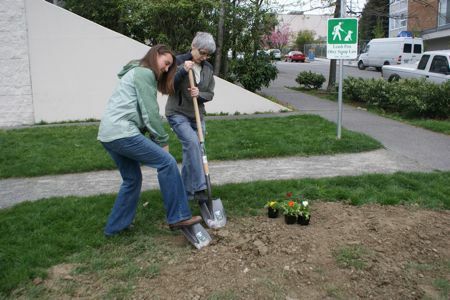 Beyond the basics in the announcement, we asked the Parks Department if there’s word yet on who will join in the dedication event, along with the West Seattleites who have worked so hard (like the planting volunteers!) to make it reality. 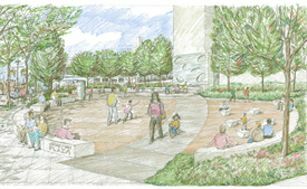 Here’s the plan so far, according to Parks’ Karen O’Connor: The city will be represented by Councilmember Sally Bagshaw, who chairs the Parks and Seattle Center Committee, and Deputy Parks Superintendent Eric Friedli; the music they’re promising will be provided by popular Seattle violinist Pasquale Santos. Friends of Junction Plaza Park hopes the weeknight evening scheduling means more people can come celebrate the long-awaited completion of the park (northwest corner of 42nd/Alaska). As JPP’s landscape architect Karen Kiest explained to us – she’s there today too – these are “pervious clay pavers” – water can soak through. Not easy to find, she said, but they managed to find a source in South Carolina. The pavers make up one “oval” of the park, while grass makes up the other, and there is a circular “performance area” on its north side. 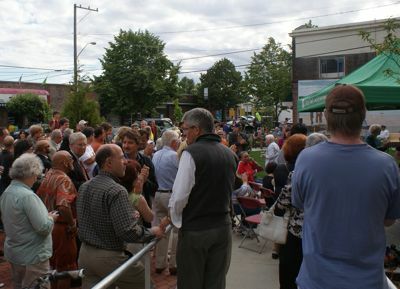 The Junction Plaza Park dedication is 5:30 pm June 29, and everybody’s welcome. 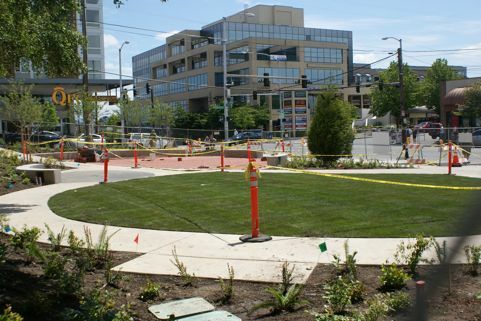 Second note: Construction work at Junction Plaza Park (northwest corner of 42nd/Alaska) is proceeding full speed ahead – and it’s time to sign up to join the community planting party right after it’s done. 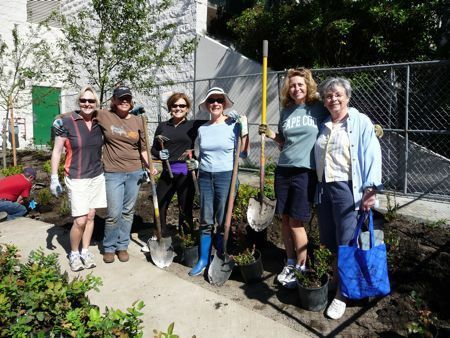 According to Friends of Junction Plaza Park, volunteers are needed to plant almost 800 native plants on June 5th – 20 for each of two 4-hour shifts. “Training, materials and refreshments are provided,” says the FoJPP announcement – just bring yourself (and family/friends if available!). 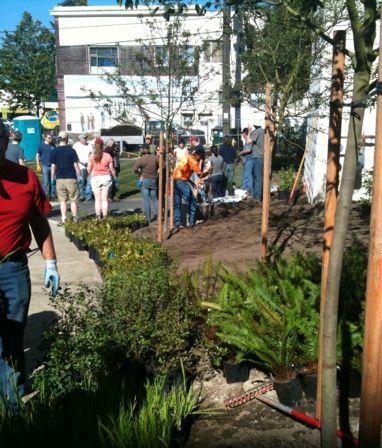 RSVP now to susan@wsjunction.org or 206-935-0904 – then after helping with the planting party on June 5, beam with pride at your handiwork as the park is dedicated at 5:30 pm June 29th. We’ve decided to have it on a weekday evening to make it easy to attend – after work, before dinner, and not interfering with weekend plans. The gathering will commence at 5:30; we’ll have some speakers, officially open the park and enjoy what we hope will be a lovely summer evening. The park is slated to be complete weeks prior, but we’ll allow time for the concrete to cure and fresh roots to take hold. 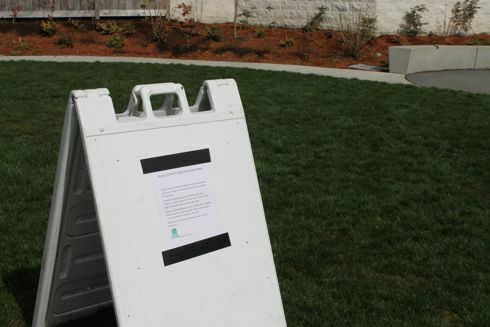 The grass area will remain closed beyond the park’s dedication to ensure a strong lawn, but will be open for Summer Fest on July 9, 10 and 11. We’re also having a community planting day on Saturday, June 5 and maybe 6th. We have almost 800 native plants to install in the park and we anticipate having two planting shifts on the 5th. About 40 volunteers will be needed and if you’d like to sign up or have questions, please email susan@wsjunction.org. Also, a new event’s planned in The Junction – WSJA is presenting a Health Fair on June 13th, 10 am-2 pm – you’ll get to meet Junction health-care providers including Westside Dermatology (WSB sponsor); more details to come. 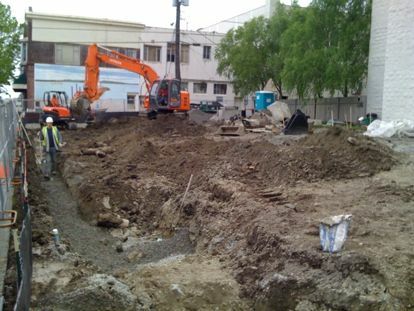 Thanks to Brian from TouchTech Systems in The Junction for sharing that photo of the intensifying work at the site of Junction Plaza Park, where groundbreaking earlier this month followed more than a few long years of work to finish fundraising and designing it. 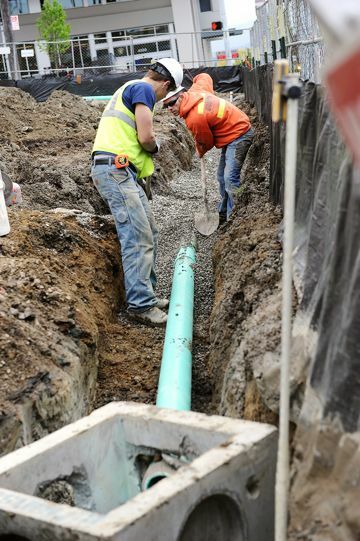 The Parks Department has said it expects to have the park done by early June. As we’ve been reporting over the past year-plus (here’s our coverage archive), while Junction Plaza Park has been in the works for more than a few years – the site was purchased in 2005 – one last major community-contribution push involving WSJA and the Junction Neighborhood Organization helped make the long-held dream a reality. We’re at the Seattle Parks Board meeting downtown – where the big news will be a briefing on the Parks budget situation, which we were just told in a pre-meeting conversation with board leaders, is a lot worse than you might think. One big problem: No money to maintain the new parks facilities funded by the Parks and Green Spaces Levy, and barely enough to maintain what the department has now. But that’s not the reason we’re writing this in-progress update: Speaking of new parks (though this was NOT in that levy), Superintendent Tim Gallagher has just told the Parks Board that a contract has been issued for construction of Junction Plaza Park, and work should start soon, with completion in time for “several summer events.” (The park is on the northwest corner of Alaska/42nd.) We’ll be tracking that; meantime, we’ll have the full Parks Board story later after the budget briefing. At Tuesday night’s Junction Neighborhood Organization meeting: Information from SDOT on the implementation of the West Seattle Junction on-street parking changes (as well as discussion of some wider transportation issues), updates on the status of Junction Plaza Park, and a plug for West Seattleites to attend upcoming Southwest District Council meetings. The meeting began with a presentation by Danté Taylor, Associate Transportation Planner for SDOT, who gave a brief review of the Junction parking study completed last year. 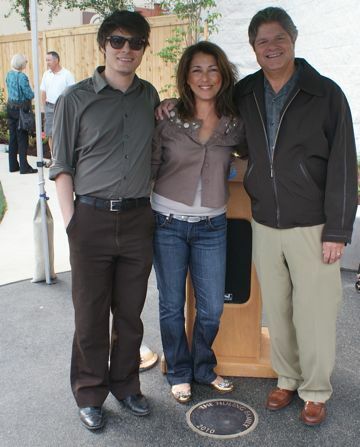 Landscape designer Karen Kiest, who worked on the original design 3+ years ago, was back to explain how it’s evolved. And Erica Karlovits, president of the Junction Neighborhood Organization who’s also helped lead Friends of Junction Plaza Park, explained where the park-project money picture is now. 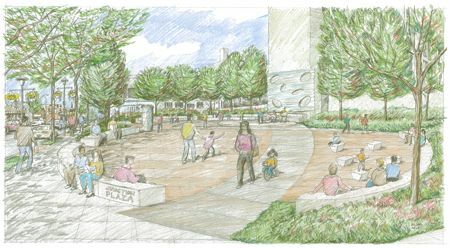 Instead of being meant mainly as a place for performances and events, the park is now envisioned as a simple gathering place, where events are possible too – the circle at the top-center of the drawing is a “performance pad” rather than a raised stage. 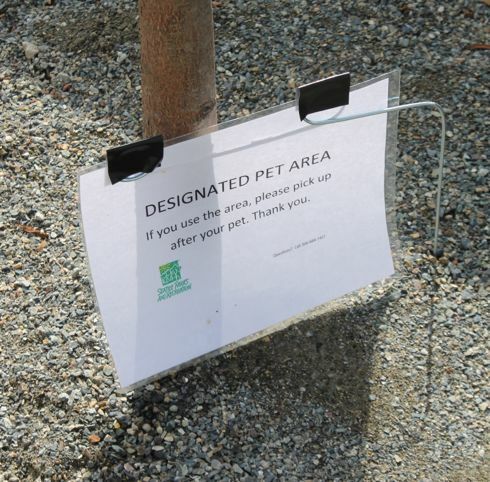 Some worried that the grass half of the park will be a magnet for the growing area residential population to bring their dogs to relieve themselves; others worried the park had too much pavement and too little grass. Susan Melrose of the West Seattle Junction Association – also a leader in Friends of Junction Plaza Park – talked about standards now being outlined for “street furniture” such as benches and light poles – not just for consultation in projects like this, but also for developers. The park won’t have an official play area, but “we do want it to be playful and friendly,” Kiest said. Its low plantings and shrubbery will come from a list of native plants, and its street trees will be “Greenspire Linden” like others in the area (including outside the new QFC) along Alaska, vine maple or serviceberry along 42nd; along the alley, in front of the existing birch trees by Alaska House north of the park, there’ll be a variant of dogwood. 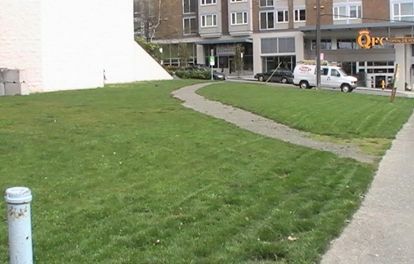 SDOT will be doing sidewalk work alongside the park; Friends of Junction Plaza Park got a grant for $60,000 of the $74,000 the sidewalk work will cost, and say that SDOT is looking for money to cover the remainder. 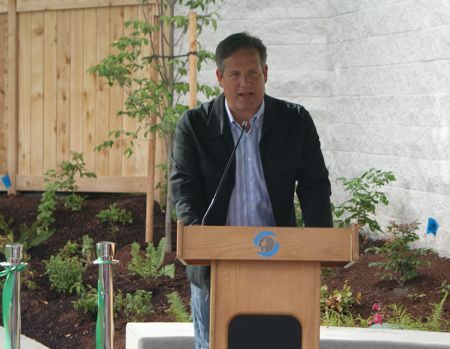 That leaves Friends of JPP with the $40,000 to raise for lighting, power and paver tone. They’ve sent out a letter to their mailing list but are also accepting donations through their website, junctionplazapark.org. 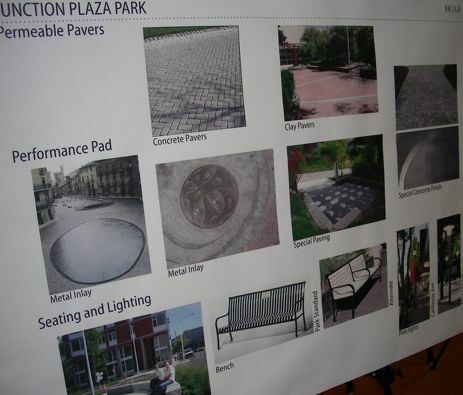 TIMELINE: Friends of Junction Plaza Park has till December to raise $40,000 more for lighting, power and brick pavers. Parks says the plan will be settled by the end of December, and the project’s likely to go out to bid early next year, with construction in the spring, done by summer. JUNCTION PARKING REVIEW PROGRESS: SDOT‘s project manager Dante Taylor (right) briefed the group –Though the decision NOT to propose pay stations for street parking in The Junction has been in the books for a month and a half, the decision on whether to make ANY changes in parking in that area hasn’t been made yet – but it’s getting closer. The Junction Parking Project Committee will meet again toward the end of this month (no date announced yet); Taylor says whatever proposal emerges after that will be put up for public comment in October; a decision would be made in November; and implementation would happen early next year. Some Junction-area residents, particularly east of the commercial core, say they’d like to see a Restricted Parking Zone so that their streets wouldn’t be crowded with “park-n-hiders” who they say drive from other parts of West Seattle to catch the bus. But Taylor showed a variety of parking-usage stats that seemed to cast some doubt on whether the spaces were consistently full enough to merit an RPZ. JuNO president Erica Karlovits said, “I don’t know what the numbers are going to tell you, but I can tell you what I see outside every day – people are lined up waiting for anybody to pull out of their space, and those people don’t come back (for their cars) till 6, 6:30 (pm).” One other tidbit: Where restrictions are posted, there’s a 90 percent compliance level — he didn’t know, however, how that compared to other parts of the city. 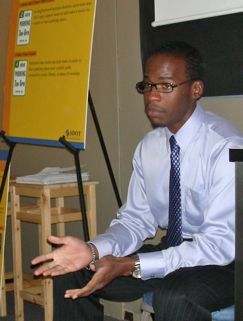 He also distributed numbers on parking usage in various areas at various times of day; you may not be surprised to hear that the least-used spaces are The Junction’s private-lot paid spaces – checks at 1 pm on two different days reported no more than 46% utilization on weekdays, no more than 19% utilization on weekends. While the RPZ issue is still clouded – Ann Sutphin with SDOT said a compromise measure might be parking restrictions in neighborhoods for certain hours of the day – Taylor said there’s a possibility that some time-limit signage could be implemented in areas that don’t have it now, toward the south end of the commercial district – he’s got a meeting coming up with the West Seattle Junction Association to listen to businesses’ thoughts. 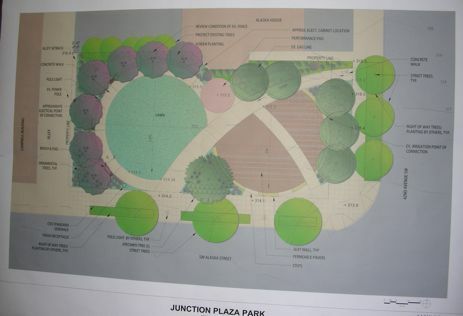 JUNCTION PLAZA PARK: According to Karlovits, Friends of Junction Plaza Park is getting close to the end of fundraising for the $350,000 or so needed to finally build the park, years after the site was purchased. 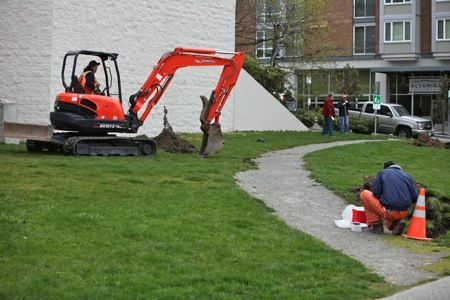 She also says that – as happened with Morgan Junction Park to the south – much-needed sidewalk work will be done in conjunction with park construction; a $60,000 grant has been secured to help with that, and SDOT is seeking funding for the remaining $14,000 or so. Karlovits says there will be one more public meeting to finalize details of park design before construction – likely in early October. If all goes well, groundbreaking could happen next February, and the park could be complete in May. JuNO usually meets every other month, second Tuesday, 6:30 pm, at Ginomai Arts Center. Followup: No Junction pay stations – but what about other areas? The Morgan Junction is the only West Seattle area on the near term schedule for a review of parking. This community parking project is tentatively planned for 2010, but that may change due to staffing availability. We still plan to work with the Admiral and Alki/Harbor Drive neighborhoods, but that will occur much further down the road. 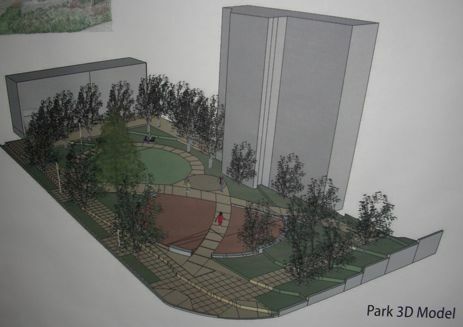 Groundbreaking this year for Junction Plaza Park (NW corner of 42nd/Alaska) looks more likely than ever, now that the money amassed for the long-in-the-works project has passed $300K: $303,554, to be precise, as announced at last night’s Friends of Junction Plaza Park meeting. 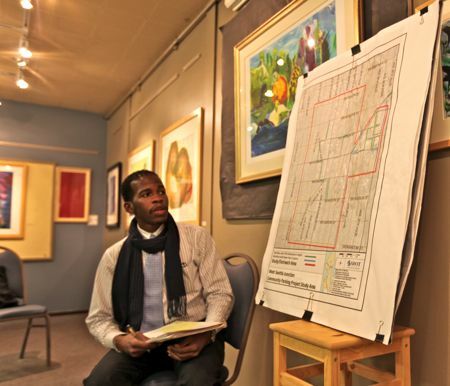 “We’re really close,” said Junction Neighborhood Organization president Erica Karlovits. The total so far includes the $98,000 city matching-funds grant announced recently; Karlovits and West Seattle Junction Association director Susan Melrose said last night they’re still waiting for word on a few more grants. One big boost for the park will come this Friday-Saturday-Sunday, from West Seattle Summer Fest, with 25% of the proceeds from a beer garden by the park site going to the project, plus donation boxes for you to make a contribution. You’ll be able to find out more about the park by stopping at the central (California/Alaska) tent at Summer Fest – Friends of Junction Plaza Park will be next to our spot, on the west side of the tent, facing KeyBank (we’ll be across from Easy Street, next in turn to the West Seattle Chamber of Commerce-staffed Information area facing Cupcake Royale on the north/east side). 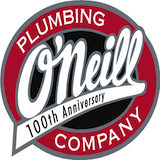 The park project also will be on the agenda for the Junction Neighborhood Organization‘s next meeting, 6:30 pm July 14 at Ginomai (SW corner of 42nd/Genesee) – it’ll be an abbreviated meeting so everyone can adjourn to the free West Seattle Hi-Yu Festival Concert in the Park with the West Seattle Big Band at Hiawatha Community Center at 7:30 that night. FRIENDS OF JUNCTION PLAZA PARK MEETING: During West Seattle Summer Fest this Friday-Saturday-Sunday, you’ll get a chance to support the final fundraising push for the park by enjoying a beer garden at the site, and a chance to learn more about the park plan at the big tent in the heart of the festival zone (California/Alaska, where we’ll be too, like last year). But first – Friends of Junction Plaza Park invites you to a meeting tonight to discuss the latest on the project and firm up the plan for Summer Fest volunteer help. 6 pm, Senior Center of West Seattle (Nucor Room). DUWAMISH RIVER KAYAK TOURS START: Also at 6 tonight, the first in this summer’s series of six “community kayak tours” along part of the waterway that marks West Seattle’s eastern boundary, presented by the Duwamish River Cleanup Coalition, Alki Kayak Tours and the Seattle Aquarium Society. Full details and RSVP info here. ADMIRAL THEATER: This Saturday night’s “Listening Room” show is also a benefit for the West Seattle Food Bank and White Center Food Bank (which serves West Seattle from SW Myrtle southward) — Admiral entertainment director Dinah Brein McClellan says one thing the WCFB really needs, for example, is bathroom tissue! More on what to bring, who’s performing and how to get tickets here. The show’s at 9 pm and includes live painting as well as music – full details here. WEST SEATTLE SUMMER FEST: We’ve been updating you on all the plans for West Seattle’s huge three-day summer street festival (a WSB sponsor), coming up July 10-11-12 (most recent update here – another big-name addition to the music slate), including the fact that the beer garden at the Junction Plaza Park site will help raise money to finish the park project. 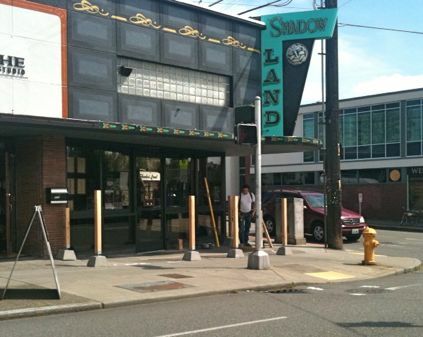 Now Susan Melrose from the West Seattle Junction Association sends an update on that – the percentage has been finalized: 25 percent of the beer garden’s proceeds will go to the park. 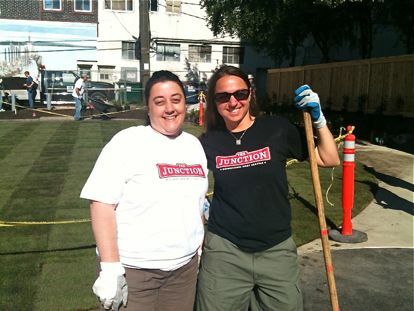 She’s also looking for volunteers to help staff the park’s booth at Summer Fest – susan@wsjunction.org if you can help. 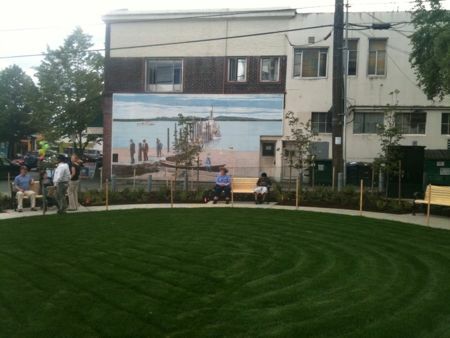 Days after West Seattle’s newest park was dedicated in Morgan Junction, there’s big news for the push to finish the long-awaited park in The (Alaska) Junction: Susan Melrose of the West Seattle Junction Association tells WSB they’ve just received word they’re getting the $98,000 city Neighborhood Matching Fund grant sought to help complete Junction Plaza Park. That brings the money gathered for the project (updated)to $295,000 – the current design will cost about $350,000 to build. (For comparison, the just-finished Morgan Junction Park cost almost half a million dollars.) 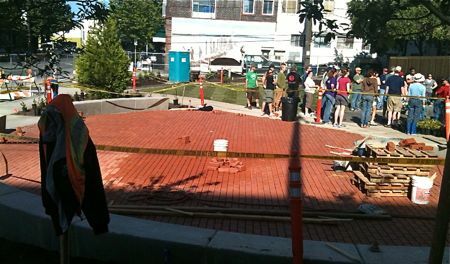 Another major fundraising push will come during next month’s West Seattle Summer Fest (WSB sponsor), with a beer garden set up at the site, proceeds benefiting Friends of Junction Plaza Park. The group also will be participating in this Saturday’s Junction Clean and Green event, which will be centered at the new Genesee P-Patch (as reported here last month) — with Mayor Nickels scheduled to appear — but also will include a Junction Adopt-A-Street cleanup with work at the 42nd/Alaska park site (just a few blocks south of the P-Patch). It’s hoped that the park project will be ready for groundbreaking this fall. It’ll also be a beneficiary of the West Seattle Garden Tour coming up July 19 (tickets on sale now). ADDED 4:09 PM: A Friends of Junction Place Park meeting also has been announced, for 6 pm July 6, Senior Center of West Seattle. Yogurt, daffodils, and order-taking for Easter ham/lamb are among the highlights promised by the Ripe and Ready list for today’s West Seattle Farmers’ Market (10 am-2 pm, 44th/Alaska). Also look for Friends of Junction Plaza Park, as they continue collecting pledges of volunteer help for the big push to get the long-in-the-works park done this year. Quick update from the Junction Neighborhood Organization meeting that’s under way right now: A new website for the project has just gone live – you can see it at friendsofjunctionplazapark.org. That’s where you can get the forms to pledge volunteer time, which is the big push right now – JuNO president Erica Karlovits, who’s co-chairing Friends of Junction Plaza Park, says the first West Seattle Farmers’ Market tabling this past Sunday collected “two pages of volunteer pledges.” They’re trying to gather as many pledges as possible before the early April deadline to apply for a city $100,000 Neighborhood Matching Fund grant to apply toward the $350,000 cost of finishing the park (on the northwest corner of Alaska/42nd in The Junction). Susan Melrose of the West Seattle Junction Association is here too and says that if fundraising and all else goes well this year, construction could start early next year.